On Saturday June 22nd 2013 we started at the 44. 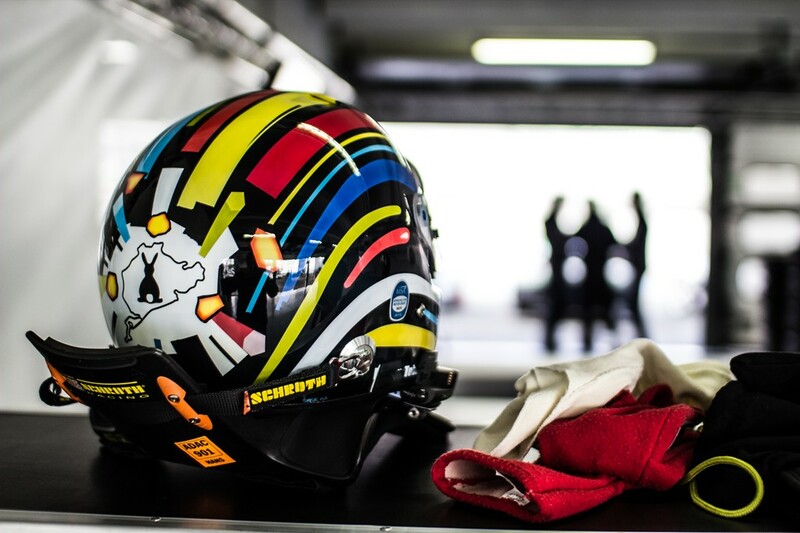 Adenauer ADAC Simfy Trophy within the VLN Endurance championship. Traditionally the race after the 24 hours race at the Nürburgring is a quite one, with less participants than usual, as many teams are still rebuilding their cars and the 24 hours race of Le Mans is taking place at the same time. Not so this time: With 189 cars registered it was a well filled starter field. In our class GT4/SP10 there were 8 cars participating. For the race service we used our backup crew Mathol Racing. Our regular drivers Andy Sammers and Ronny Tobler took on the 4 hour long challenge. The weather gods meant well when we started for the qualifying on Saturday morning. The sun was shining which meant ideal conditions for our two drivers. 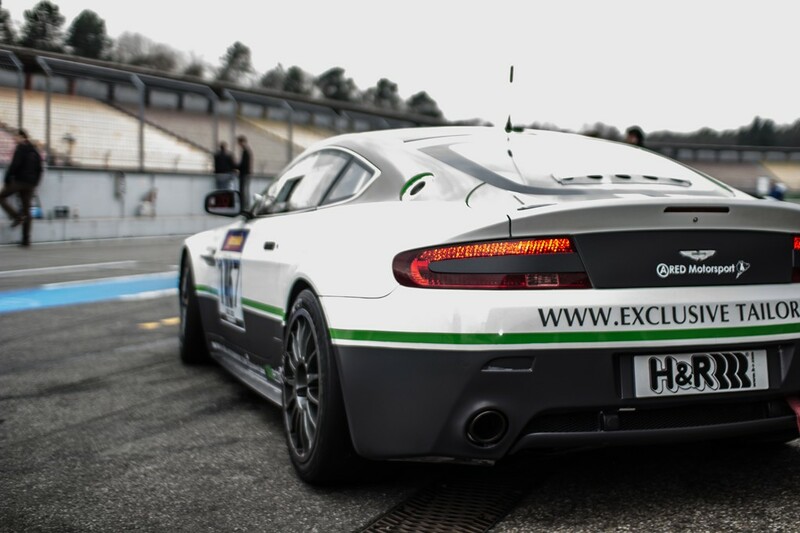 Andy set a new fastest lap on our Aston with a 9:21 and qualified #177 on position 69 for the race. Andy drove the start for the first time and could improve our position lap by lap. “The time that we put into the setup and testing of the car was well invested”, said Andy Sammers after his stint. “The car now gives me the trust necessary to drive closer to the limit.” After a good first stint Andy handed the car over to Ronny. Ronny’s stint was accompanied by constantly changing conditions. At the beginning there was just a bit of drizzling rain on different parts of the track. There was enough grip for the slick tires but caution was advised. This was also the beginning of many yellow and double yellow situations because of accidents that took place. “Based on what I observed I’d say that a few accidents happened because of circulation problems because of the high temperature in the cars. In the double yellow phases where you have to lower your speed to 60 km/h I could observe drivers being treated by doctors with their legs up in the air,” so Ronny after his stint. In Ronny’s second to last lap the rain intensified and the track was wet from the GP track up to kilometre mark 14 on the track. At this point the slick tires were a risk and it was difficult to keep the car on track. Ronny gave the signal for Andy to prepare one lap earlier than planned for the driver change. But the driver change was not meant to happen because of very tragic circumstances. 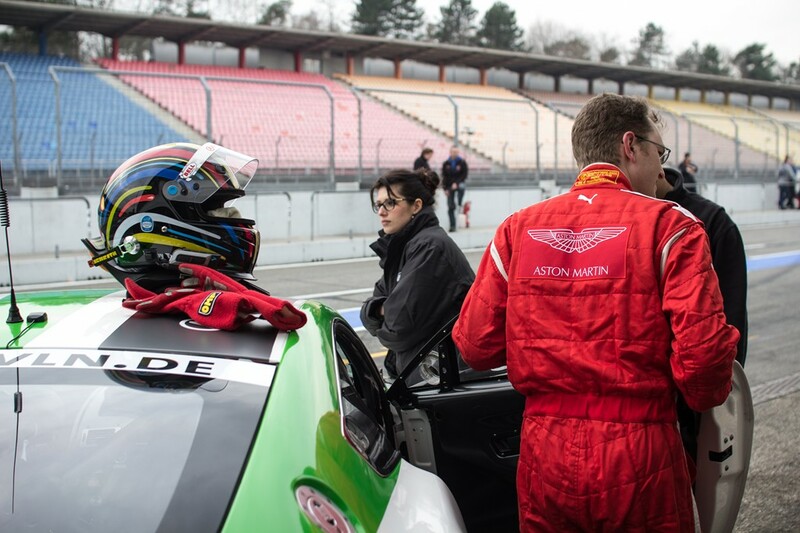 When Ronny arrived on the long straight Döttinger Höhe the marshals waived the red flags – race has been aborted. After a short time in the pit the race management ordered the cars into parc fermé, the race was finished and should not be restarted. A short while after, the sad reason was announced: Wolf Sylvester, 55 years old, VLN regular driver and two times champion 2006 and 2010 died as a result of a heart attack on the track. 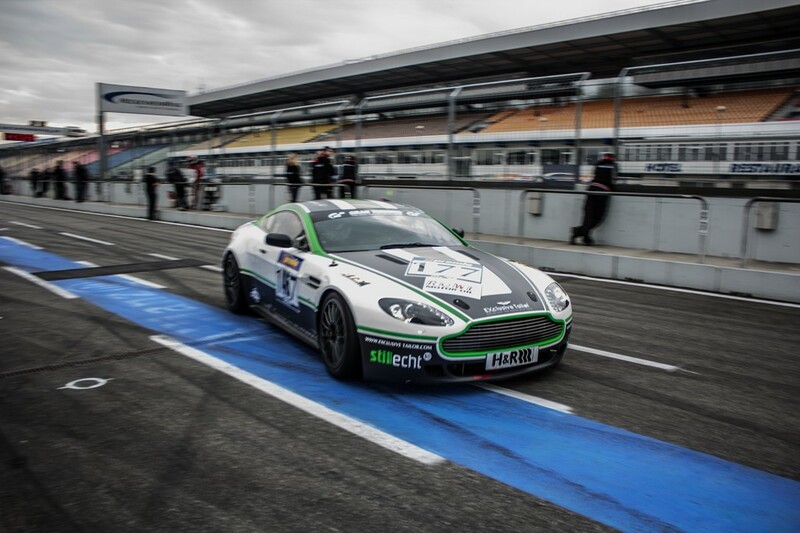 A few hours later news came from Le Mans: Allan Simonsen, 34 year old Aston Martin Racing driver died as a result of a severe crash in the hospital. We feel deep sorrow for both deceased and commemorate their families for their loss. Andy and Ronny drove their best race yet on their ARED Aston Martin and reached overall position 33 and third place in class. The weather forecast for the third VLN race did not look good. 90% rain probability for both days is not what you’re looking for driving the most difficult track on earth. This race weekend we had the first six guest of our season. They were part of the team on Saturday for the race and guests on the passenger seat in the training on Friday. On Friday afternoon dark clouds covered the sky and it started to rain. 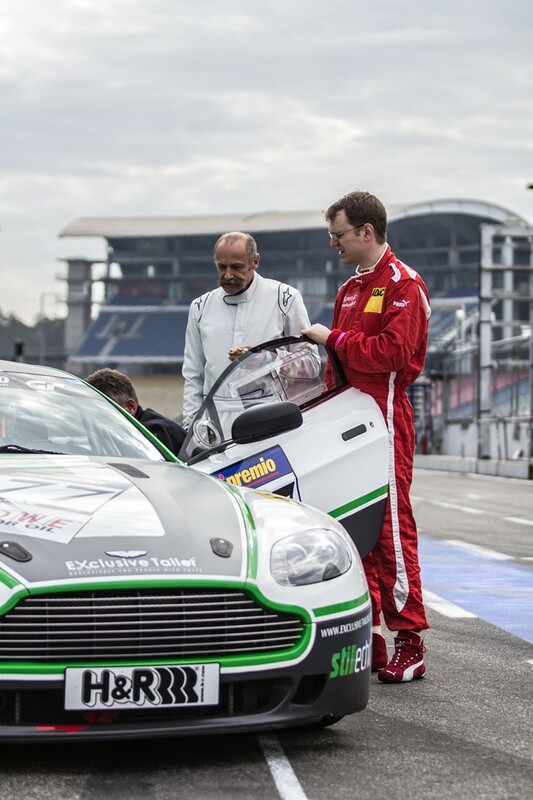 We fitted rain tires on the Aston and our guests received racing suits and helmets for the exciting wet ride through the ‘green hell’, as for the Nürburgring’s nick name given by Jackie Stewart. The temperatures were around 5 degrees with heavy rain and it was difficult to get the tires up to temperature. The guest taxi ride in the cold wet was around thirteen minutes long instead of the usual ten minutes per lap. After ninety minutes we drove all guest fast and safely around the track and were ready for the group shot you see here with seven happy faces. Now it was time to get the car to the technical check for the race the day after. On Saturday morning for the qualifying the weather had not improved. We decided to do only two laps per driver to keep the car safe and undamaged for the race. Both Andy and Ronny completed the two laps without issues. Two hours later for the start procedure it was communicated that two introduction laps instead of one will be driven. The temperature was still at five degrees and it rained. Furthermore it had fog on different parts of the track to block visibility. Already the introduction laps posed a difficulty to some drivers. Ronny noted a badly damaged Peugeot 308 and less damaged Mercedes SLS and Porsche 911 cup. After these two very slow laps the race was released. “I was astonished how well the drivers behaved on the track and looked after each other, as I’ve rarely had a yellow phase in the first seven laps”, said Ronny after his first stint. It was Ronny’s first real wet race and therefore he took it on carefully. “It was very difficult for me to drive the car faster in the wet. I was just lacking the grip needed. We need to work on the setup of the car for these conditions to improve our lap times”, said Ronny after the race. After seven laps Ronny handed the Aston to Andy who should drive the middle stint. “After one wet lap the track quickly dried and I improved my lap time by one minute. After the start finish line the steering suddenly became stiff and I spun on the GP track. I noticed that something is wrong and carefully finished the lap and drove into the pit”, said Andy Sammers after three laps. The problem was identified but it was not possible to exchange the part quickly during the race. The servo pump failed to operate and without the servo it was not possible to complete the race. “We have a great deal of work ahead of us, luckily we have almost eight weeks between now and the next race due to the 24 hours race”, so the conclusion of Andy Sammers.